KATHMANDU, Aug 10: Hundreds of students in earthquake-hit districts will have to study under tents and inside cracked buildings risking their life and limbs for another three years. The government has just started reconstructing school buildings in the quake-hit districts, aiming to complete the task in three years. 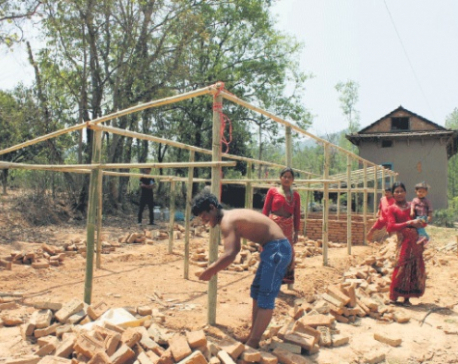 "The task of rebuilding the schools has begun and the project will be completed in three years," Hari Prasad Lamsal, spokesman for the Ministry of Education (MoE), said. “We have already initiated the bidding process for rebuilding 62 secondary and higher secondary schools of the 14 worst-hit districts." According to the MoE, a total of 5,003 schools in 14 districts were damaged by the earthquake in April 2015. According to the National Reconstruction Authority, 7,200 schools in 31 districts were affected by the earthquake. The Post Disaster Needs Assessment (PDNA) report of the National Planning Commission estimates the damage to infrastructure and physical assets at around Rs 28 million. It has recommended an allocation of Rs 39,706 million to revive the education sector. The PDNA report states that as many as 8,242 community/public schools were affected by the earthquake, with 25,134 classrooms completely destroyed and another 22,097 partially damaged. Private schools also suffered significant destruction to their infrastructure with 956 classrooms completely destroyed and 3,983 partially damaged. In addition, 4,416 toilets as well as water, sanitation and hygiene (WASH) facilities, and 1,791 compound walls were damaged. Asian Development Bank (ADB) and Japan International Cooperation Agency (JICA) have pledged Rs 11.5 billion and Rs 8.5 billion, respectively, to reconstruct the damaged schools in 14 severely-affected districts. The ADB will work in eight districts: Kathmandu, Bhaktapur, Kavre, Sindhupalchowk, Dolakha, Ramechhap, Okhaldhunga and Sindhuli. JICA, on the other hand, will concentrate on six districts: Gorkha, Dhading, Nuwakot, Rasuwa, Lalitpur and Makwanpur. In the project document submitted by them, ADB had pledged to rebuild 700 schools and JICA 600 schools. The government has assured to provide a grant of five billion rupees in the current fiscal year to reconstruct primary and lower secondary schools affected by earthquake, according to the MoE. The government in cooperation with development partners has planned to develop 14 model schools one each in 14 earthquake-ravaged districts. The Indian Embassy in Nepal has also assured to reconstruct 70 schools of Gorkha, Dhading, Nuwakot, Sindhupalanchowk, Dolakha and Kavrepalanchowk districts, while Embassy of People's Republic of China has promised to rebuild seven schools--two each in Sindhupalchowk, Rasuwa and Dolakha, and one in Kathmandu, according to PIU. Similarly, different I/NGOs have pledged to reconstruct 1,000 schools in the earthquake-hit districts. “Development partners, USAID and other INGOs are willing to join the reconstruction of schools in Nepal. The USAID has initiated its process to assist in the reconstruction of schools,” said Shrestha.